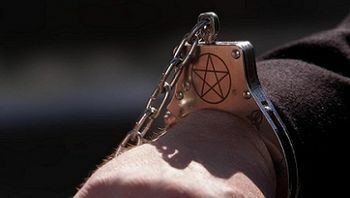 Colloquially referred to as "angel cuffs", these handcuffs are etched with various sigils that act as binding links to nullify the powers of angels. Despite being referred to as "angel cuffs", the spellwork eteched into them are also effective in restraining demons and reapers. They prevent the entities from using their powers, reduce their strength, prevent teleportation, and in the case of demons and angels, prevent them from vacating their vessels.